Christmas is the season intended to acknowledge the birth of Jesus Christ, and it is also when traditions are being observed by families and friends such as getting together for a Christmas dinner and staying up till Christmas Eve. This is also the specific season when people give more gifts and blessings compared to the other seasons of the year. This is why Secret Santa programs are conducted during Christmas parties in companies and organizations. For this, a Secret Santa form must be prepared by the company management for their employees and their staff. What Is a Secret Santa Form? A Secret Santa form is a type of document which can be used by company employees for indicating the list of gifts or a wish list that they would want their secret Santa to give them for their company Christmas party. In a Secret Santa form, the employee who will be joining the gift exchange program of the party will have to state his name, the group or the category that he is participating in, and his list of preferred gifts. Additionally, there can also be a section in the form which will introduce and inform the employee about the Christmas party and the program such as the date when the party will occur, the party’s venue, and the theme of the party. Why Is a Secret Santa Form for Work Important? A Secret Santa form is important because it is a document that serves as a bridge that permits the communication of two parties, the Secret Santa and the requesting person or the recipient of the gifts. Another purpose of the form is that it ensures that every participant or employee who will be joining the party will have their own Secret Santa which can be identified by the number of Secret Santa forms which are filled out. For this, the number of filled out forms should be equal to the number of attendees of the party. Step 1: Prepare the document or the sheet to be used for making the form. When preparing the sheet, the style format and the margins must be set up. Border designs and other decorations can also be placed into the form which makes the Secret Santa form a creative document that will reflect the spirit of the holidays. Step 2: Make the header. The header should have the name of the business company who will be hosting the party, the title of the form, and the important details of the party. In addition, the logo of the company can also be included in the header as well as the logo of the party if there is a specific one made for promoting the event. Step 3: Add an area for identifying the user of the form. The user of the form is the recipient of the gifts from his Secret Santa. The data to be collected in this section of the form should only be limited to the name of the user, however other details can also be included depending on the theme and the requirements of the company. For instance, if the company has assigned years or decades for a retro party to each employee group, then the assigned retro year of the recipient of the gifts should be stated in the form along with his name. Step 4: Include a section for the list of the gifts. This would be where the user of the form can enlist his preferences, interests, and specific gifts if he has decided on what his Secret Santa should give him. At the top of the list, a set of instructions can be indicated which will inform the recipient or the user about the limitation of the gift amount or the price range to be noted when naming gifts or requesting items from the Secret Santa. Step 5: Save the form with the right file name and extension. The form should be named “Secret Santa Form” and must be saved in a file extension which can be reused and be updated in the future. However, before saving the form, the contents must be reviewed and be rechecked to ensure that it will serve its purpose and collect only the relevant information from the users, and will deliver sufficient data to the Secret Santa. Secret Santa Questionnaire Form – Compared to a basic Secret Santa form, this document gathers more information about the recipient of the gifts along with his name and his electronic mailing address. In the form, the user or the recipient of the gifts will be able to disclose the date of his birth and his zodiac sign, hobbies and interests, things that he always wanted, his dream vacation, and the person that he longs to meet. Moreover, there is also a section intended for the favorites of the recipient which ranges from his choice of car, music, color, book genre, flavor, movie, animal, as well as whether he likes handmade gifts and electronic gifts which can be sent to his email or not. Secret Santa Shop Volunteer Form – In a business shop, especially those which serve goods and offer services related to the Christmas or the holiday season, it is essential that the schedules of the staff and employees will be clarified to determine who will be working during the holidays and on the Secret Santa event that the shop will be organizing for their clients. For this, a Secret Santa shop volunteer form will be the type of document that the shop owner must make for his employees who may want to volunteer service and their time for the event. A Secret Santa shop volunteer form contains two sections wherein the first section is for the introduction or the short letter addressed to the volunteer. The second section of the form, on the other hand, is for the chosen schedules of the volunteer which will indicate the time and dates when the volunteer will be taking over to provide his services. Additionally, how and when the form must be sent to the authorized person who will be accepting and documenting the volunteers’ schedules is also indicated at the bottom portion of the form. 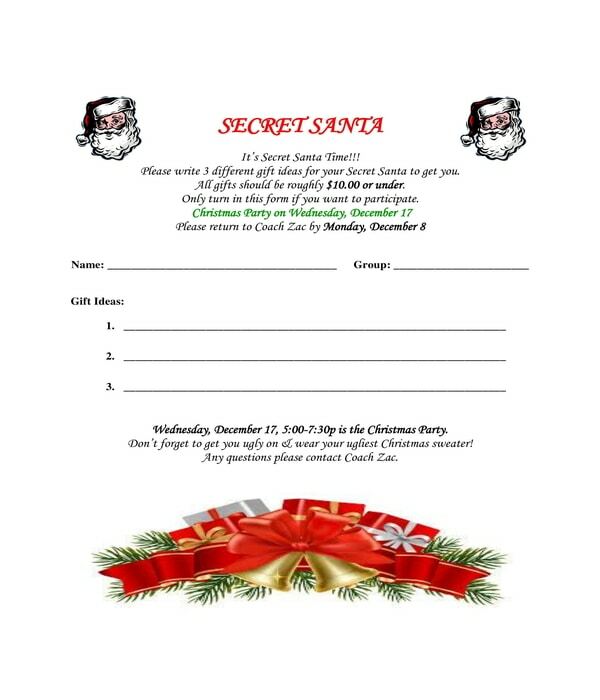 Secret Santa Sign Up Form – This variety of Secret Santa form is to be used by companies and organizations on the day the event or the gift-giving program is announced. 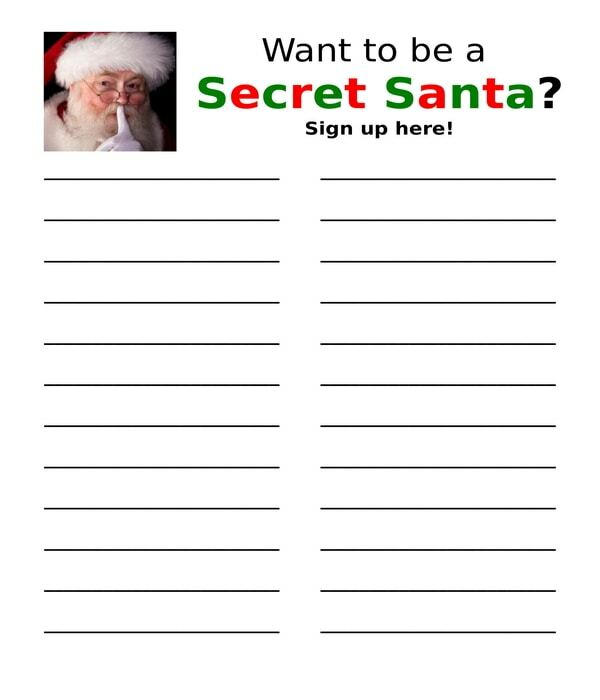 Basically, a Secret Santa sign up form will allow employees and staff to enlist their names if they want to be part of the Secret Santa program. This form can be placed at a specific area in the company office where employees can easily see it for them to be engaged about the upcoming events for the holiday season in the company. 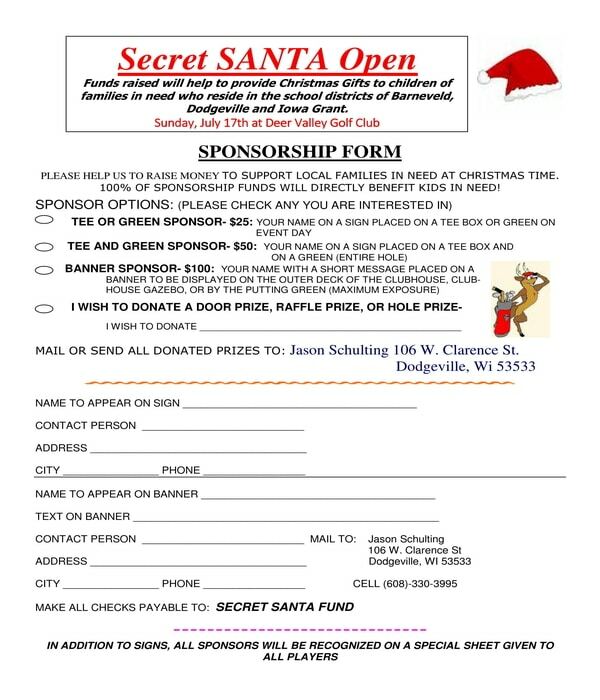 Secret Santa Sponsorship Form – There are companies who prefer to give donations and gifts to charity organization rather than conducting a Christmas party event for their employees and staff to enjoy during the holiday season. And one of the most common methods of informing and engaging employees is through a Secret Santa program wherein funds will be raised to be used in preparing for the charity event and the gifts to be given to the recipients. For this, a Secret Santa sponsorship form can be used by employees who plan to give or donate funds to the company. The Secret Santa sponsorship form has three sections. In the first section, the user of the form or the employee who will be donating for the event will be able to know more about the event that he will be participating in. The second section of the form is where the employee can specify his donation or sponsorship choice of whether he will be donating a gift box or a raffle prize. Where the donations can be sent by the employee is also indicated below the options list. Lastly, the third section of the form will be for the preferred name of the employee which will be placed on the greeting card or sign on the gift box along with his contact information, and his address. 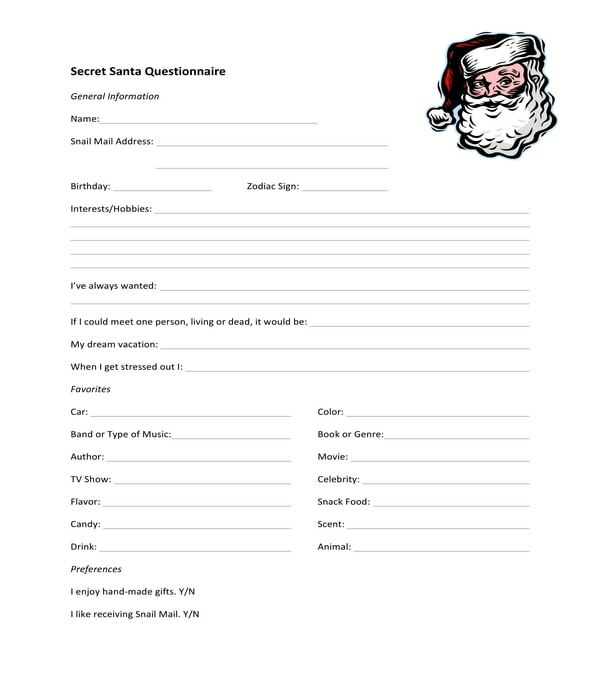 Secret Santa forms must be made with creativity, however, the contents of the document must be relevant to the information to be used for the event. And regardless of the variety of Secret Santa form that a company will be making, the company must ensure to document the data stated in each form before it will be handed or be presented to the employees. This is to make sure that the data, such as the wish or gift list of the recipients, will not be changed without the knowledge of the assigned personnel in order to maintain accurate records throughout the period of the Secret Santa program.